This blog is a place where I allow myself to spill all of my thoughts about running, so for the most part that is all I talk about on here. However, there are other parts of my life that fill a much bigger piece of me than running does. There's my family- of course- but another large part is my faith. I am a member of The Church of Jesus Christ of Latter Day Saints. I know it creeps up occasionally on my blog, but in my real life, my faith is ever present in every move I make. I love it and I wouldn't have it any other way. It's why I never run on Sunday. It's why I have been able to run certain races that I thought were going to be un-run-able. It's why I am the person that I am. There is a blog called Mile Posts that is written by a fellow Christian named Dorothy Beal. She is an incredible runner, and an incredible person. 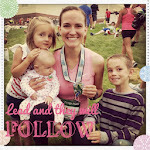 She wrote a post awhile ago called "26.2 Bible Verses" that was just featured on BlogHer in anticipation of the New York Marathon. Talk about something to focus on when you are trudging through the depths of misery :). It is inspiring and encouraging! I am planning on printing it off and carrying it with me when I run Ogden next year. Read them! I promise they will lift you up and encourage you. I love when I open my google reader and see that you've posted something new. Totally makes my day! I love this post! I'll have to go check out that other blog too! It sounds great. It's funny how we can fill up a whole blog with something we really enjoy, but isn't the main focus of our lives. I really enjoy hearing all about everyone's running trials and triumphs but it is nice sometimes to learn more about the person behind the posts. Faith and family are two of the biggest pieces of my life too! Thanks for sharing this! I follow Dorothy's blog already and I love her 26.2 verses. I absolutely love how passionate you are about your faith. You poor your heart and sole into everything you do and I truly admire that about you. I am going to have to check this out. Thank you for sharing.